One of the biggest fears of US based cloud providers is that they would see a dramatic drop off in foreign business after former NSA contractor Edward Snowden released a treasure trove of documents that said government intelligence agencies had the abilities to spy on private businesses. The report’s findings indicate that 26% of those who responded said “Yes.” The 26% that answered yes were asked to follow up on their answers in efforts to further clarify. Of the 427 respondents who had initially answered yes, 34% followed up saying that “Fear of the intelligence community spying” was the main driver in navigating away from US-based companies. By doing some rapid calculations, it seems that 9% of all respondents felt as if the threat of intelligence agencies tampering with cloud data was a big enough concern to avoid American cloud providers all together. Is 9% a significant figure? It really depends on who you ask. The Register, based out of UK, wrote that “Snowden didn’t scare many out of US clouds.” Silicon Angle insists that this swing is a significant blow to US based providers. The Forrester Report itself gives us insight into the perception of American cloud providers through the lens of a IT decision maker overseas. The Forrester report mentions that businesses should always take additional steps to encrypt their data and to look for providers that facilitate these services. 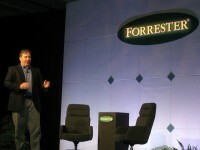 The post Forrester Releases Report On Impact of Snowden Revelations appeared first on CloudWedge.